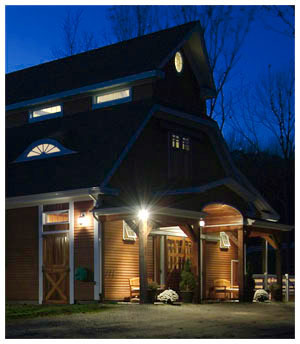 Mossy Creek Stables is a unique boarding and training facility located in beautiful Temple, New Hampshire. Our luxury equine accomodations, and equally luxurious appointments for people are a welcome respite from everyday life. Whether you choose visit for a weekend getaway, take lessons or attend a clinic, the magic of Mossy Creek Stables will leave you and your horse feeling right at home! See our Lessons & Clinics page for details about what we have to offer horse owners and riders. In addition, we proudly offer breeding services to our Percheron Stallion, Magic, as well as horses for sale, custom equipment for sale, photography services, Bed & Breakfast accomodations and more! 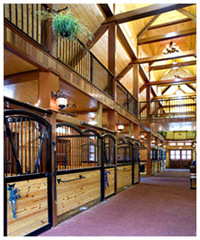 Mossy Creek Stables and Elite Barn Structures featured in the June 2010 issue of Architectural Digest. © 2008 Mossy Creek Stables. All rights reserved.